In Lower School, rich co-curricular programs combine with high-quality instruction in the core areas of reading, writing, mathematics, social studies, and science. In addition to their main classroom experience, students in transitional kindergarten through fifth grade attend complementary classes in Spanish, art, physical education, music, and character education. Throughout the year, field trips and guest speakers enrich the classroom experience. A Buddies program builds community within the Lower School. Building on students’ natural curiosity and enthusiasm for learning, the Lower School lays the foundation for academic achievement while fostering social skills, self-confidence, and respect for peers and adults. Click on a subject below to learn more about the specific curriculum. The language arts program incorporates phonics and spelling instruction, authentic literature, and writing to develop reading fluency, a love for reading, and communication skills. Teachers rely on whole group and small group activities that focus on individual reading levels to reinforce and extend decoding and comprehension skills. Using high-level and engaging literature, students explore concepts that are integrated across the curriculum. The writing process involves brainstorming and other prewriting activities, drafts, revisions, and publishing. Students are encouraged to use writing as a means of self-expression. Vocabulary and grammar instruction provides students with the tools they need to read and write effectively. While fostering a love for reading and writing, the language arts program in the upper elementary grades builds on the basic skills taught in the primary grades. At each grade level, students read and respond to a variety of literary genres, and reading selections focus on concepts that encourage real-world connections. Students begin to learn and apply formal grammar and vocabulary skills to various forms of writing, including writing descriptive essays, research reports, narratives, mysteries, and poetry. Instruction in language arts is integrated with other subjects so that students can examine common themes across the curriculum and can make connections to ideas that they are studying in other subject areas. Click Here Math In Focus, a Comprehensive Approach for a presentation of our New Curriculum, Math in Focus. Through exploration and guided practice, skill building activities, games, centers, and numeracy integrated with other subject areas, students come to see that math is everywhere in their world. Math instruction gives students the tools they need to be able to use math in their everyday lives. Students work at mastering concepts through a variety of instructional presentations, incorporating visual, auditory, technological, kinesthetic, concrete, and abstract methods for all different types of learners. Problem solving activities encourage them to use logical thinking and to look for many ways to find answers. The main areas of focus are number sense, computation, algebraic thinking, geometry, measurement, and graphing. Students are encouraged to use a variety of strategies, including written practice, small group activities, skill drills, and games, to foster mathematical intuition and understanding. The math program stresses problem solving and real-life applications, and mathematical processes are applied across the curriculum so that students begin to see the power of mathematics in their lives. Topics explored include numeration, operations and computation, patterns, algebraic thinking and algebra readiness, fractions, decimals, measurement, and geometry. In science, students begin to understand the world we live in by exploring earth, health, life, and physical science. Using hands-on experiments, center activities, discussions, literature, field trips, and projects, teachers encourage students to think critically and to apply their scientific understanding to the world around them. Topics studied include plants and animals, weather, matter, geology, and astronomy. The classroom experience is supplemented with Science Lab. Students attend Science Lab twice weekly, performing a variety of experiments and activities. Science classes encourage students to explore the world around them as they focus on the systems and patterns that provide order to it. In order to cultivate students’ scientific understandings and skills, teachers rely on a mixture of instructional strategies: demonstrations, hands-on experiments, discussions, videos, readings, guest speakers, projects, and field trips. In addition to their regular classroom instruction, students also work in the science lab to further apply their skills and knowledge. They use technology to research hypotheses, analyze data, and present findings. The primary goal of social studies is to encourage students to explore their world. Students learn about geography and different cultures and begin to recognize and appreciate similarities and differences among cultural groups. Group discussions, projects, and hands-on activities provide opportunities for students to examine communities and to practice respect and responsibility. Students work towards an understanding of the world around them and their roles within it. By examining communities, both near and far, as well as present and past, students come to understand geographic, political, economic, and social concepts and systems. Then, they are able to make comparisons across place and time using their knowledge and experiences. In 4th and 5th grades, students study North Carolina history and United States history, respectively. They begin to hone in on the details of specific areas and start connecting the past with their present. The Spanish program encourages students to make connections between Spanish language and cultures and their own language and cultures. Students at all grade levels sing, dance, move, draw, read, and write as they develop Spanish language skills and understanding. Conversational Spanish is a strong focus as well. In addition, math, social studies, literacy, music, and art are integrated into the Spanish curriculum. This course exposes students to a variety of media, techniques, and artists’ works. There is a focus on elements of art and the principles of design, as well as an effort to integrate art into the academic subjects. For example, fourth graders create perspective drawings and models with scale factors as they learn about proportions in math. In order to foster an appreciation for art, artworks are connected to artists and art history movements. M.C. Escher (1898 – 1972) – A Dutch artist famous for his tessellations and mathematical themes. J.M.W. Turner (1775 – 1851) – A British artist famous for his expressive, atmospheric seascapes. Marc Chagall (1887 – 1985) – A Russian artist famous for his many styles: Expressionism, Surrealism, Cubism, and Fauvism. Joan Miro (1893 – 1983) – A Spanish painter, sculptor, and ceramicist famous for his Surrealistic style of art with almost ‘cartoon-like’ characters. Frederic Remington (1861 – 1909) – An American artist, illustrator and writer famous for his “Wild West” paintings and bronze sculptures. Pablo Picasso (1881 – 1973) – A Spanish painter, sculptor, printmaker and ceramicist famous for his many styles, and co-founder of Cubism. Faith Ringgold (1930 – ) – An African American artist famous for her children’s books and Story Quilts. 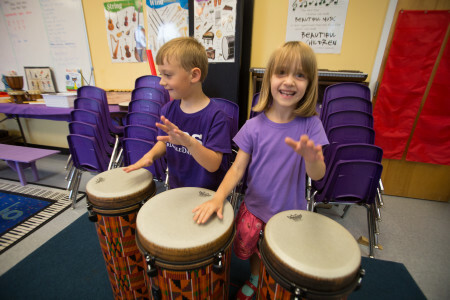 The TDS music program focuses on the development of musical literacy through hands-on, student centered, discovery-based learning. Students develop skills in collaboration, problem-solving, and creativity through singing games, composition, and playing instruments. Music appreciation is developed through listening, responding, and analyzing music. Students have the opportunity to perform at various school events, including two whole school performances each year. In addition to weekly music class, 3rd-5th grade students can participate in a Lower School Chorus. Middle School students are able to join a chorus or handchimes ensemble to continue their music education. All ensembles perform at multiple events throughout the school year, including a Winter and Spring Concert. The primary goal of TDS physical education curriculum is to promote fitness and healthy lifestyles. Students participate in a movement based curriculum as they are challenged to understand the relationships involving self, space, equipment and others around them. Inclusive activities promote the refinement of skills and the introduction of combination skills involved in more complicated activities and games. Group activities, cooperative games, and problem solving are integrated into more physically demanding situations, allowing students to challenge their skills while building their concept of self.